The white roads of the Basque Country! This stage is going to cause havoc. 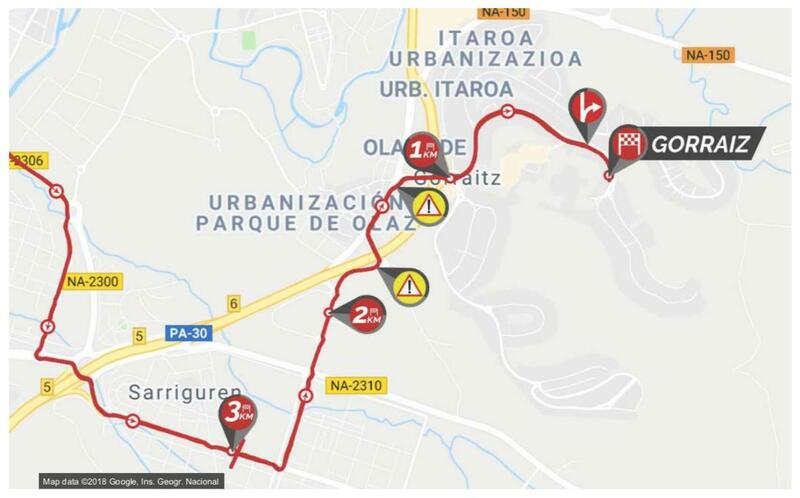 The organisers have managed to find some white road sections for the peloton to travel on, these sections are incredibly narrow, that’s going to be the main issue. The entrance to the sections will mean that the peloton will do a full sprint lead out, which will stretch the elastic. Once onto the section, there is every chance of the elastic snapping and catching out some of the GC riders. We have six sectors: 200m, 700m, 1800m, 400m, 800m and 900m. We’re not talking Strade Bianche, but life won’t be easy, and this is a stage that will concern many riders. The most difficult sector is the longest one, as it’s also uphill, averaging 6.4%. I can’t stress the importance of positioning, the entrance to the sectors is almost a joke, I couldn’t quite believe it myself. Lots of roundabouts for the riders to deal with. I’m boring myself now, but positioning is very important! The last 1.3km rises at 5%, but the final 570m is at 8.4%. This is a tricky little finish for the riders, it’s too hard for the sprinters, just as well none of them are actually here! This is a great finale for the puncheurs, but timing the launch of the sprint will be very important. Going long will be very difficult, think back to Matthews’ win in Catalunya, ideally you would wait for the final 100m. Another day spent looking up at the clouds. Rain is forecast for the morning and late afternoon; it looks like a wet day for the peloton. That should make the white roads much more fun! Julian Alaphilippe – this stage looks like it was made with him in mind. The winner of Strade Bianche will have no problem with the white roads, and he’ll love the finish. QuickStep have the team needed to put him into a good position for the final kilometre, then it’s over to him. Given his form, he has to start the stage as the big favourite. Paddy Bevin – he’ll love this finish. The Kiwi has the kick required to seriously challenge for the win, remember he won a tough finish in the TDU. Bevin wasn’t able to time his sprint right in Catalunya, he needs to show more patience in the closing kilometre. Enrico Battaglin – his move to Katusha hasn’t started very well. He usually is good in this type of finish, remember back to his win in the 2018 Giro d’italia, but his form is non-existent. Michal Kwiatkowski – the Pole loves a tough finish. He’ll be happy to see the white roads turn this into a GC day and get a reduced sprint, but there is no guarantee this happens. When he’s in top form, he can win a stage like this, just cast your mind back to the 2018 Tour of Poland, but is he at that level yet? Jay McCarthy – the Aussie didn’t have the best of luck in Catalunya, something which should give him some extra motivation. This is a race he likes; he won a stage in 2018. The finish is a good one for him, he has one of the quickest finishes in the bunch. Bora have a number of options for this stage, but McCarthy should be their man for the sprint. Max Schachmann – he might not be happy with McCarthy being the man for the sprint! After a stunning win in the TT, the German will want to be leading from the front, in order to pick up some bonus seconds. He will want to stay in the race lead for as long as he possibly can. Bjorg Lambrecht – this race has been a target of his for a number of months. The little Belgian packs a real punch and he’ll love the look of this finish. Some of his rivals do have a faster sprint, that means he should consider trying to catch everyone by surprise and attack before the sprint gets launched. Simon Clarke – recent form has been great, the best he’s ever been. The Aussie has a fast finish, but it’s unlikely he’ll beat Alaphilippe. I wonder if he’ll try and make an early move and attack with 500m to go. Jonathan Lastra – as this is Caja-Rural’s home race, you can bet they’re super motivated to shine. The squad have a number of options: Lastra, Aberasturi and Aranburu, but judging by recent performances, I think Lastra will be their chosen son. 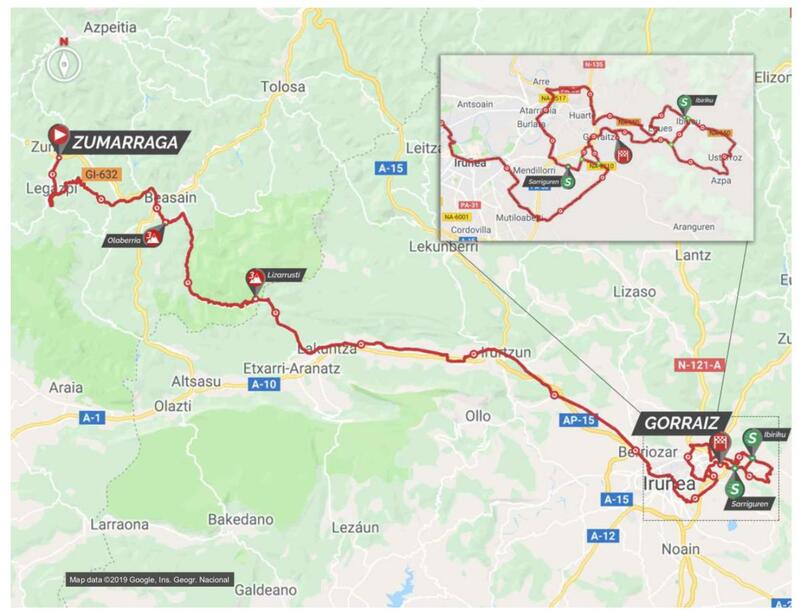 Riding for a pro-continental team obviously makes life hard in terms of winning the stage, but it would be great to see Lastra challenging for the top 10. Unless something strange happens, it’s a day for Julian Alaphilippe.